Users are getting charged a color printing rate, when printing to a black and white printer. Reports are showing color jobs or pages on a black and white device. The most common reason for this is the driver being used is a color driver, or a universal driver that is sending full color to the device, even though the device can’t print it. The best way to determine if this is the case is to view the Properties of the printer queue on the print server, and see if it is a color driver. b. Within properties, locate the Color feature. It will say Yes if a color driver is being used. c. To Resolve the issue, upgrade to the proper driver for that black and white device, or contact your printer manufacturer for further support. 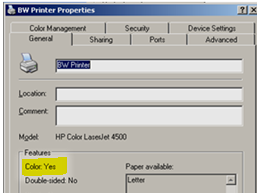 Starting in Print Manager Plus 8.0.137.183 there is a Color Override feature that can be used to report all jobs as Black and White, or all jobs as Color per each print queue. The follow steps cover enabling this. a. 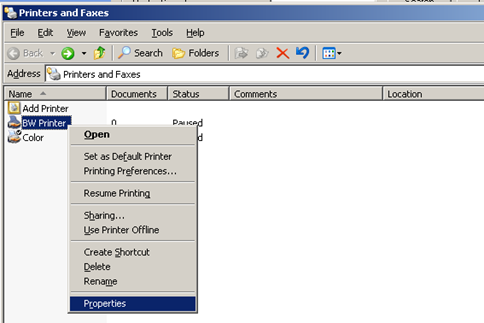 Open the Print Manager Plus Administrator, and go to the Printers Tab. b. Open the properties of the print queue you are having this issue on and open the [Advanced Settings] tab. c. Within Advanced Settings, select [Track all Jobs as Black and White]. In the rare event that the Printer Manufacturer does not supply a properly created black and white driver for your device, you can manually override this within Windows using the registry. 1. Make a full backup of your registry. 3. Within that registry key locate the subkey for your Black and White Printer. 4. Within the Printer’s registry key, will be a subkey named DsDriver. 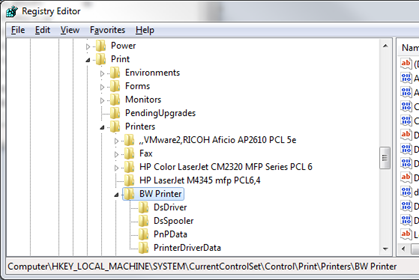 This is where the driver tells windows whether it is a color or black and white printer. The printColor value will be set to 00 to mean it is a black and white device.